been a run of crazy comedians..."
When discussing director Penelope Spheeris, I hesitate to suggest she has led a charmed and magical life, only because that might imply that her acclaimed work in film has been more a gift from the good luck fairies and less from the good old fashioned sweat of hard work. And that would simply be a falsehood. An untruth. And while she is indeed charming, her accomplishments are nothing less than well-earned. Someone once said, 'you make your own luck.' And that's exactly what Penelope has done. She burned the late-night candle earning her Masters Degree at UCLA...and then kept her ears open and her eyes peeled for any opportunity she could grab. She walked on the wire and absolutely dared anyone to tell her she couldn't do it. She was fearless. She rattled windows with her amazing documentaries about the music culture. She smacked us around a bit with films about alienation and desperation. And she coddled us with light-hearted comedies. Penelope is a complete badass. (More about that later.) She sticks her chin out and picks up her feet. And because of this bravado, while on her lengthy film-making journey, she might've helped remove a few more barriers making it possible for other girls who desire to point the camera to dream, too. Go get you some. Casey Chambers: You were making music videos when people didn't even know what music videos were. How did you get started doing that? 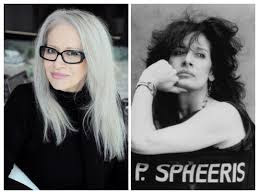 Penelope Spheeris: I was just graduating from UCLA and a friend of mine at CBS Records, Peter Philbin, called me up and he goes...'How would you like to make a music video?' And I said, 'What is that?' (laughs) And he said, 'We figured out that we don't really need to send a band around the world anymore. We could just shoot a video and show the whole world that way by sending a little piece of film around.' And this was in the early '70s, so it wasn't even called a video at that point. We were shooting 16mm film. But that's how I got started. I shot my first music video at The Troubadour in Los Angeles and I shot my last music video at Paramount on a soundstage doing "Bohemian Rhapsody" with "Wayne's World." Casey Chambers: Do you recall the very first video you shot at The Troubadour? Penelope Spheeris: Her name was Chi Coltrane. She was a beautiful young blond girl with a piano and she sang a song. She was related somehow to John Coltrane. And yeah, I don't think anybody ever really...but after that, I worked with CBS on a lot of other acts. And with Warner Brothers Records. And Casablanca, etc. Casey Chambers: Were there any artists you especially enjoyed shooting videos for? Casey Chambers: That'll never go out of style. Penelope Spheeris: Yeah, it was great. I shot a lot of what they called...sales presentations. They had these centers in different areas of the country where the sales reps for Warner Brothers Records were. So I would shoot a half hour or an hour reel to introduce the new product. I did Fleetwood Mac and Curtis Mayfield. The Staple Singers. I mean, there was so many of these things I did. Casey Chambers: In the '70s, you began making short films with Albert Brooks for SNL. How did you begin collaborating with him? Penelope Spheeris: Well, I was at UCLA and there was a sign on the bulletin board. You know, there was no social media back then so you'd put a sign up on a post. And it said that these two guys needed a transcriber to transcribe some tapes 'cause they were doing a movie on Jimi Hendrix. And the movie turned out to be called, "Jimi Hendrix." Those guys were Gary Weis and John Head. Gary and John were really good friends with Lorne Michaels. And I would always be hanging out with Lorne. Now, this was before "Saturday Night Live." And I actually heard him say, 'I think I'm gonna go try to start a late night, Saturday night, kind of thing in New York. Maybe live or something.' And then, he went and did it. Lorne asked me to go to New York with him to work on the show. John and Gary did, but I didn't. I had a young daughter and I wanted to keep her in school here. And she was four at the time. She's 47 now so that was 43 years ago. It was right before the show started. Right before "Saturday Night Live" started. He said, 'When you're out in California if I have anything to do out there, will you help me with it?' And then one day, he called me and said, 'I found this really funny guy, but he doesn't know how to make movies. Penelope, can you show him how to make movies?' (laughs) I had just graduated from UCLA with a Master's in film and I was pretty good technically...so...I taught Albert Brooks how to make movies. Casey Chambers: And you guys went on to make a number of shorts together for SNL. You walked him through the process. Penelope Spheeris: I was officially the producer. He was officially the writer/director. And to be honest, back then, women really... it would've been very audacious to say that you want to even dream about being a director, okay? So, I just thought...well, I'm here to serve so he can do what he needs to do to create his art. So our relationship was such that...ya know...I put together the crews and I got the equipment. And he and Harry Shearer and Monica Johnson worked on the shorts for "Saturday Night Live." He had his writing buddies, and I put all the production together for them. I technically showed him how to make movies. Casey Chambers: Funny can be pretty hard to get right on film, but you seem to have had a pretty good eye for it right outta the gate. I didn't set out to be a comedy director. If I would have had my druthers, I would have been a more serious, dramatic director. I think I would rather have spent my entire life doing films like, "Suburbia" or "The Boys Next Door" which I did with Charlie Sheen. More serious movies. People always ask me why I did so many different kinds of genres. And my answer is, I just took whatever job I could get. When they start offering you these huge salaries to do these goofball comedies...and I couldn't get the other ones made...I took the money. I hate to say it, but what was I gonna do? Casey Chambers: You're going to take it, of course. (laughs) But whatever genre you dip your toe in, you seem to have a certain knack for capturing the right...something...with everyone in your films. 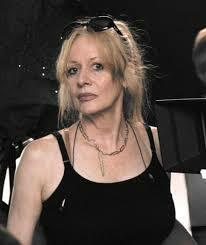 Penelope Spheeris: Some actors are just awesome to work with. I just did an interview with Jon Cryer a couple of days ago for this film we did in 1987 called, "Dudes." And "Dudes" never really got a release because it was just too weird back then. It was a punk rock western, ya know? But now it's getting a release, thank God. Finally! 30 years later. But Jon came down, and as I sat there speaking with him, it reminded me that some actors are just indescribably wonderful. Like Jon Cryer. Jon Cryer is the most cooperative and giving. He's just awesome. I don't really take credit for bringing out their talents. They either have it or they don't. There are certain actors that I feel like I could never work with again. And I can't say who that is because they sue people. But it's all about the actor. The actors are the ones that really make the show, I think. Casey Chambers: A punk rock western. I'm there. Now, I'm sure you've been peppered about this, but it's the 25th anniversary of your most successful film..."Wayne's World." (1992) You nailed it! "Excellent!" How did that project play? 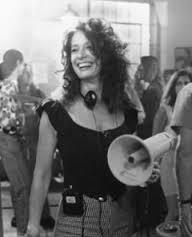 Penelope Spheeris: When I worked with Lorne on "Saturday Night Live," I was always trying to write and direct some short films like the ones I was producing for Albert. And Lorne...he would never approve them. He said, 'Well, just write me something really funny, Penelope, and then, of course, you can do it.' But I would write and write and write and turn them in and nothing would ever happen. Casey Chambers: Yeah, that was right in the vicinity of your wheelhouse. And they wanted something out quick, right? Penelope Spheeris: Well, it took 34 days to make and it was a tight schedule because back in those days, which was 1990, $14 million was very low budget...'let's just give this guy a chance'...kind of money. But there wasn't enough time. I mean, there wasn't enough money to have more time and that's why it was made so fast. Casey Chambers: That must have been a big bucket of pressure and stress. Penelope Spheeris: Yeah, and after having worked with Albert for so long I had developed all of these kinds of neurotic hypochondriac kind of weird things, ya know? (laughs) I don't think I've ever told anybody this before, but I remember working on "Wayne's World" and I was like, 'What's going on here? I can't swallow right. I must have cancer. I must have...' (laughs) Because Albert is a terrible hypochondriac. And being around him, you just get so neurotic. (laughs) The stress was bad, but then it was also so much fun. So it was cool. Casey Chambers: Were you already a fan of the sketches on SNL? Penelope Spheeris: Yeah, I thought they were funny. I was like Paramount though. 'How do we make this into a movie?' They were real nervous about it. It's hard to explain. And I don't think anyone ever can explain how come that movie did what it did and lasted as long as it did. It was kind of...some kind of cosmic magical moment where the right chemistry, the right people came together, at the right time. It's weird. I don't know how it happened. Nobody knows. Casey Chambers: "Wayne's World" has so many silly, funny moments, but the "Bohemian Rhapsody" scene will no doubt be forever imprinted into our minds. Whose idea was it to incorporate that song into the film? Casey Chambers: And the headbanging is probably the most iconic scene from the movie. Casey Chambers: Every teenager in America has been in that same car with Wayne and Garth! Penelope Spheeris: That's right! Exactly! It was just like...total teenage exuberant fun, ya know? Casey Chambers: Seeing Rob Lowe venture into the comedy waters was a surprise. And you really made it work. Penelope Spheeris: Yeah, Rob had just come off of some bad publicity. It was Lorne's idea to work with Rob and to cast him in that role. And I said, 'Really? You want to put Rob Lowe in here? Look at what he's been in the news for, ya know?' And he goes, 'Oh, it's over, Penelope. We'll get him cheap.' (laughs) And Rob was great. Casey Chambers: Since I'm throwing names out...Chris Farley made his movie debut in this picture, too. Penelope Spheeris: Yeah, Lorne called and said he had found another funny guy, but that he was really shy. And he thinks he's gonna have a great career ahead of him. So Chris came out and I just had to take a lot of time with him and be real gentle with him because he was very nervous about doing the part. It was just a tiny little part. He did make it his own though. He did add some elements to it that I think was really funny. (laughs) He was doing all those weird hand movements and everything. Penelope Spheeris: Yeah, he was. I just look at Chris like...there are certain people that are just too delicate and sensitive and fragile for this world. It's the only way I can describe it. He was a really sweet guy. My mom used to say things like, 'There's not a bad bone in his body.' And that's the way I felt about Chris. He's just a good dude, ya know? Casey Chambers: Lovely guy. Some directors are known to make cameos in their pictures. Did you ever try doing that? Casey Chambers: Well that certainly wouldn't have been as clever as Hitchcock, but it would've been just as amusing. (laughs) Who or what inspired you to become an artist? Penelope Spheeris: I think artists come from different places really. But one theory I heard lately, which I think is really interesting, is that when people have a really traumatic incident in their life at an early age, it makes them want to excel to greatness. Okay, so this is a concept I heard which I really...kind of embrace. If you look, there are a lot of people who...and I'm not saying I've excelled to greatness...I'm just saying that what inspired me to be an artist I think is...my father got murdered when I was seven years old. Casey Chambers: No, I didn't. Thank you so much for sharing and trusting me to hear it. You make a good point, too. We had mentioned "Black Sheep" earlier. I know it's been 20 years since the shoot, but do you have a favorite scene or two from that movie? It was hilarious. Penelope Spheeris: Oh, thank you. I think I really like the scene where Chris is rolling down the hill. Because he did most of it himself...and I couldn't talk him out of it. Casey Chambers: He was doing his own stunts? Penelope Spheeris: A lot of it, yeah. And let's see, what else? I also really like the scene where they accidentally get loaded in the car with the nitrous oxide in the back. Yeah, those scenes are always fun where people are stoned and they didn't mean to be. (laughs) I don't know why. Casey Chambers: Funny stuff. Well, what does Penelope Spheeris have looming in the near future? Casey Chambers: Alright! How deserving! Penelope Spheeris: Yeah, they're going to show all of my "Decline..." movies. They showed "Wayne's World" a couple of weeks ago. And I heard it was packed. So, yeah, there you go. Casey Chambers: Those "Decline..." documentaries are legend. Congratulations. Getting a badass award is...pretty badass. Casey Chambers: No way. (laughs) They only do these things because they love you. Well, this has been great. Thank you very much for taking the time to speak with me this morning. It's been a real honor. Party on, Penelope. Penelope Spheeris: Oh, you too, Casey. Thank you.